April 2013 – Share SharePoint Points ! Its really great to start working with SharePoint 2013 :). 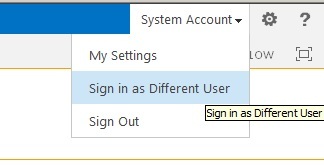 But sometimes strange was noticed that “Sign in as different user” option is missing. Well I was guessing the reason why its not by default added in the menu may be MS wants that user don’t hack the site by wild guessing the passwords but its very troublesome if you have two different testing users. Microsoft has made it known that they have worked to make SharePoint 2013 a more streamlined, efficient, out-of-the-box solution, and in doing so are discouraging users from customization. However, some of the features that were removed still need to be navigated in some way. The “Sign in as a Different User” command is one example. The reason behind precious link went away is, it can lead to problems especially when opening documents, say in Microsoft Word, excel.